Marshall running back Tyler King (3) makes a cut-back move during a second quarter run against Old Dominion during a Conference USA football game on Saturday, Oct. 15, at Joan C. Edwards Stadium in Huntington, W.Va.
MURFREESBORO, Tenn. — High fives. 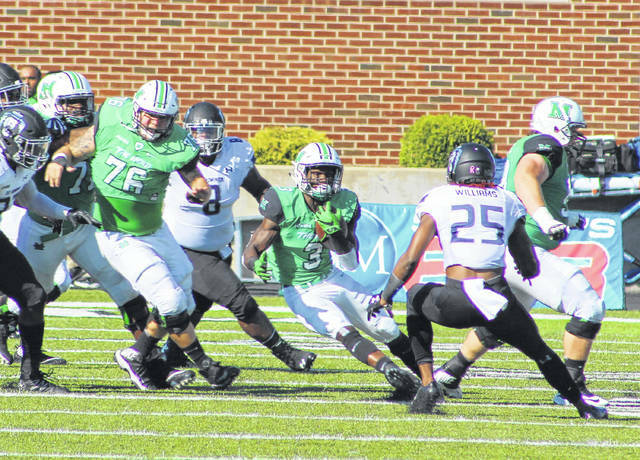 Marshall produced five touchdowns, scored points on five different occasions in the first half and picked up its fifth straight victory on Friday night during a 38-10 decision over host Middle Tennessee State in a Conference USA East Division contest at Johnny ‘Red’ Floyd Stadium. The Thundering Herd (6-1, 3-0 CUSA) led wire-to-wire and became bowl eligible with a relentless ground attack that churned out 198 rushing yards and four touchdowns, not to mention a defensive effort that produced a pick-six and held the Blue Raiders (3-5, 1-3) to just 273 total yards of offense. The Green and White took the opening drive of the game and covered 75 yards in eight plays, which led to a 7-0 lead following a Tyler King 15-yard scamper at the 10:55 mark. MTSU responded on its first drive by marching 51 yards in eight plays, which ended with a successful 50-yard field goal by Canon Rooker at the 7:25 mark for a 7-3 contest. The Blue and White were facing a third-and-nine at their own 19 near the start of the second quarter, but Artis Johnson stepped in front of a John Urzua pass and returned the interception 17 yards to the house — giving the guests a 14-3 edge with 13:24 left in the half. On the first snap of the ensuing drive, Omari Cobb forced and recovered a fumble on a completed pass — giving Marshall the ball at the MTSU 18-yard line. Three plays later, Keion Davis gave MU a 21-3 advantage following a 9-yard run at the 11:48 mark of the second period. Both teams traded punts, then the Blue Raiders strung together an eight-play, 80-yard drive that ended with a 9-yard TD pass from Urzua to Richie James. The hosts’ only TD and final score of the night made it a 21-10 contest with 7:03 left. The Herd retaliated with an eight-play, 63-yard drive on their ensuing possession that ended with a 1-yard plunge by Davis for a 28-10 edge with 3:44 left. After MU forced a punt, the guests covered 53 yards in 10 plays before adding to their lead. Kaare Vedvik converted a 25-yard field goal attempt with 17 seconds left, giving the Herd a 31-10 advantage at the break. MTSU managed only 91 yards of offense during its five second half possessions, which included two punts, two drives that ended on downs and a missed 43-yard field goal. After a scoreless third quarter, Marshall completed the 38-10 outcome with a six-play, 38-yard drive that was capped by a 1-yard run by King with 12:47 left in regulation. The Herd picked up its third straight road victory, a first for the program since the 2015 campaign. The guests are 5-0 in games this year when scoring first, and the 28-point margin of victory was also Marshall’s largest of the season. MU outgained the hosts by a 366-273 overall margin and claimed a 21-15 edge in first downs. The Green and White were also plus-2 in turnover differential. King ran for 129 yards and two touchdowns on 23 carries, while Davis added 40 yards and two TD runs in the triumph. Chase Litton was 16-of-24 passing for 168 yards. Marcel Williams led the MU wideouts with four catches for 46 yards, followed by Tyre Brady with four grabs for 22 yards. Chase Hancock and Malik Gant led the defense with five tackles apiece. The guests recorded six sacks and eight tackles for loss, with Channing Hames leading the charge with two QB sacks. Brad Anderson led MTSU with 51 rushing yards on 13 carries, while Urzua was 14-of-30 passing for 220 yards with a pick and TD toss. James led the hosts with five receptions for 37 yards. D.J. Sanders led the Blue Raider defense with seven tackles. MTSU had seven tackles for loss, but did not record a sack. Marshall returns to action Saturday when it hosts Florida International in a Conference USA contest at 2:30 p.m.